PALMVIEW — An officer here remains on unpaid suspension after his arrest early Sunday morning. Edward Oscar Cervantez, 34, was charged with assault after someone called Cervantez’s fellow officers early Sunday morning. At about 3:45 a.m. Sunday, officers arrived at a residence in the 300 block of Veterans Boulevard and encountered a woman with an injury to her forehead. The woman later identified Cervantez as the one who caused the injury, according to a statement released by Palmview Police. Cervantez’s girlfriend, who has not been identified, told officers that Cervantez grabbed her hair and pushed her head into the wall in a “violent” manner before forcing her out of the residence, the release states. Police said once the victim was back inside the residence, Cervantez, who was not on duty at the time of the alleged incident, approached her with a gun in his hand. Cervantez then allegedly cocked the gun and pointed it toward the woman, police said. “The (alleged) victim stated that Cervantes racked the slide of the gun and pointed the gun toward her. The (alleged) victim stated that Cervantes then threw the gun toward her and told her to kill him,” according to the release from Palmview police. 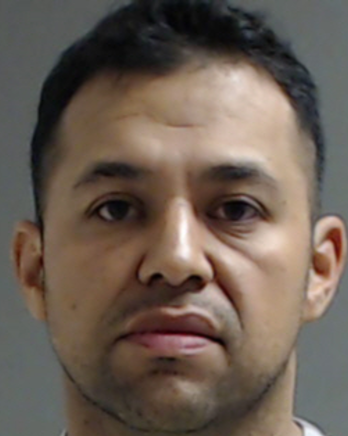 Cervantez, who showed symptoms of intoxication during his arrest, was transported to the Palmview jail before he was formally charged with assault, family violence, according to the news release. Cervantez is the second Palmview officer involved in a run-in with the law since last year. Last year Palmview police dispatcher Jacobo Daniel Rivera was arrested and eventually charged with in connection with a crash that left Kryztal Lynn Luna of Mission dead. Rivera faces one count of murder, one count of evading arrest causing death, one count of manslaughter and one count of evading arrest causing serious bodily injury, according to court records. Authorities allege Rivera was fleeing from a Texas Department of Public Safety trooper at about 2 a.m. Aug. 17 moments before he crashed the Ford Mustang he was driving into a concrete pillar on an Expressway 83 underpass. Luna, 21, who was the Mustang’s owner, was seated in the passengers’ side, while another Palmview police officer, Juan Martinez, was seated in the back. This is the third local law enforcement officer to be involved in a run-in with the law since late April. Most recently two officers from the San Juan police department were accused in connection with a federal investigation, beginning in late April, related to a drug conspiracy case. Palmview Chief Chris Barrera in his statement said he and the department were taking the incident involving Cervantez seriously. “The Palmview Police Department is greatly concerned over the arrest of one of our officers over allegations of domestic violence. We care about the safety and well-being of the citizens that we serve and believe that any allegations against our officers must be investigated fully in order to maintain community trust and transparency in our department,” the statement reads. Cervantez posted a $2,500 bond and was released from custody Monday, jail staff said. Barrera said Cervantez will remain on suspension pending the outcome of an internal investigation into his conduct.